As we marched around the room in my CC Class, I had an epiphany! 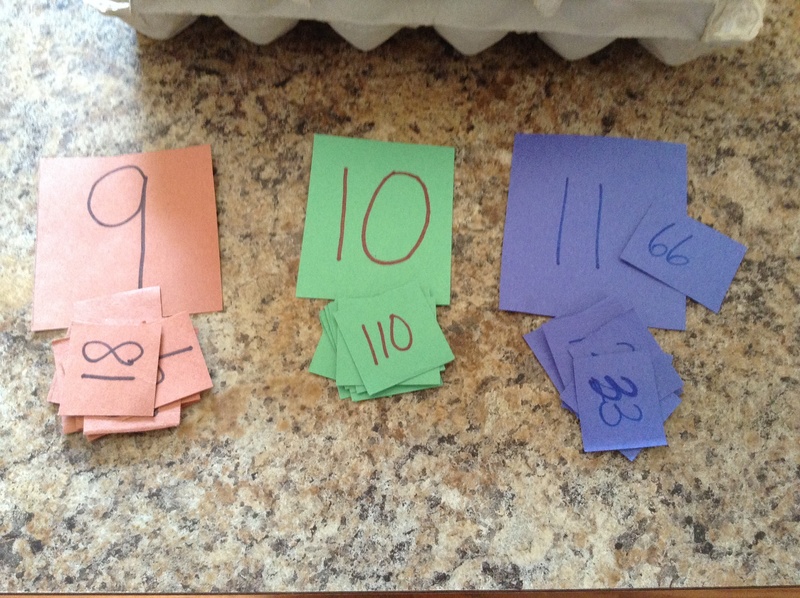 We learned the first 12 numbers of every skip counting set–1s, 2s, 3s, 4s, etc. I immediately visualized this “Egg Carton Multiplication” or “Egg Carton Skip Counting” game in my mind. I went home that afternoon and made it. Here’s how you can make your own! I’m sure you’ll have each of these supplies already at home. Don’t you love that?!?!? Also, if you have older children have them assist you in making this! They will be even more excited to use it because they helped make it! 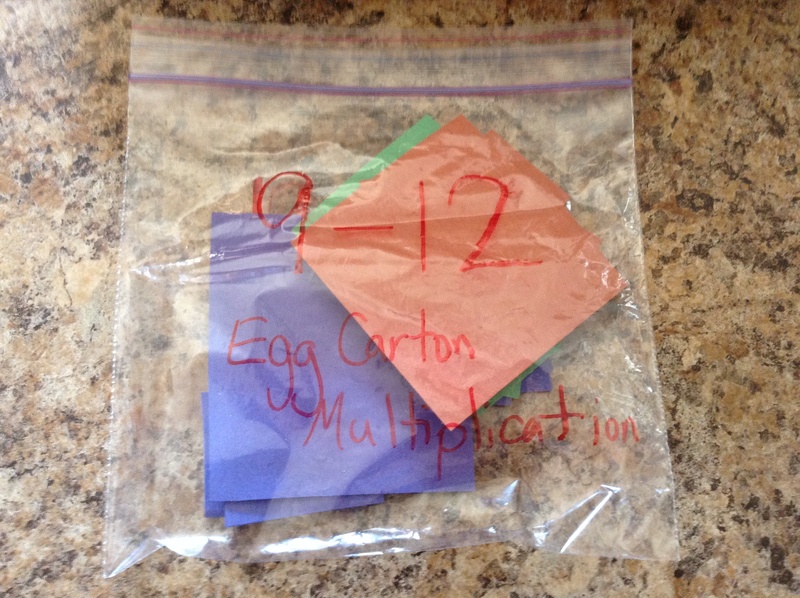 Supplies needed: 1 egg carton (number the bottom of your carton 1-12), construction paper, sharpie/marker, and ziploc bags (for storage) or go here for a FREE PRINTABLE of all the needed number tiles so that you don’t have to take time to make your own! 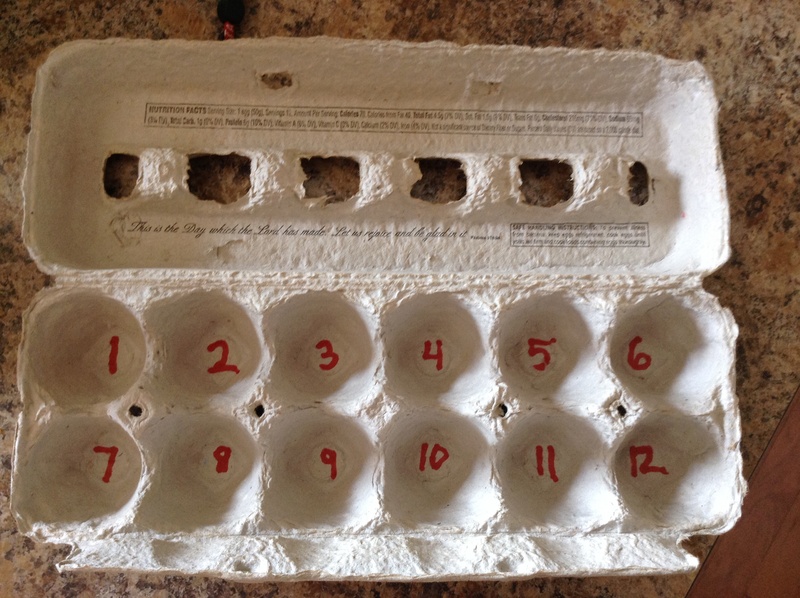 1) Number your egg carton–Use a Sharpie or marker to number the 12 compartments in the egg carton. I, then, numbered the 12 small squares–11, 22, 33, 44…up to 132. I made number tiles for the 1s, 2s, 3s, 4s, etc. up to the 15s. Side note: For Skip Counting the 13s, 14s, and 15s, they memorize beyond 13×12, 14×12, and 15×12. For those 3 examples, I had my sons put the remaining tiles in order following the “12” container on the outside of the egg carton. 3) Storage–Store your Skip Counting tiles in ziploc bags. I put 4 sets in each ziploc bag and made sure that the 4 sets were different colors. This allowed me to quickly sort which numbers go with which set. I keep all of my ziploc sets in a File Folder for easy access to use during my school day. For skip counting: I give my sons the 12 small tiles and the egg carton. I tape the large tile with the number we’re “skip counting” onto the top of the egg carton. In the example above, we’re skip counting the “11s.” He, then, has to put the small tiles in the correct order in the egg carton. For multiplication: I would do this activity with my child to ensure that he/she is reviewing the multiplication facts. For example, you can ask your child, “What is 11×4?” He/she would find the answer and have to put the correct small tile inside the “4” compartment of the egg carton. This is also a great visual allowing him/her to see the large “11” tile, the “4” written in the egg compartment and the “44” written on the small tile. Hopefully, this is further cementing “11×4=44” into his/her brain! I hope this is a helpful, frugal, easy-to-make resource for your home that helps your child master skip counting and multiplication! This post is part of a Classical Conversations Cycle 2 Link-Up over at Half A Hundred Acre Wood. Click below to find other Cycle 2 resources. Nice Suzanne! Love it! …from your visual learner friend – Colleen @ Solagratiamom! I love this idea so much! It will make the transition to multiplication so much easier for our younger two. Thank you for sharing! I hope that it will help your sons! It was a lifesaver for our oldest last year. Skip counting has definitely made the transition to multiplication seamless and painless. sooooooooo thankful that CC introduced us to skip counting! Just found this via Pinterest and I LOVE it! 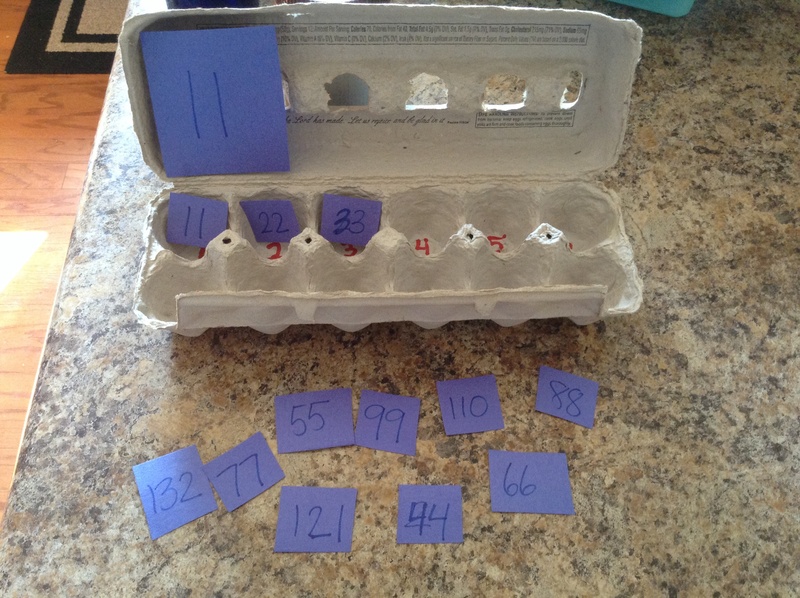 I might put the tiles in plastic eggs labeled with the number instead of in baggies. We are doing CC for the first time this year and both my kids have struggled to get the skip counting (4 yr old and 6 yr old). that is a GREAT idea to keep them in plastic eggs! brilliant!!! with your 4 year old, you will probably need to do the activity with him/her if he/she can’t recognize larger numbers yet. I had to help our second son with it last year (he had just turned 5). Enjoy! SURE! Glad to pass this idea along! 🙂 I hope it’s helpful for your family! As always, you have changed my life!!! Absolutely brilliant!! oh, Amy! I haven’t changed your life have I?!?!? you’re too funny!!! how’s your CC year going?!?!? Love this idea! I am definitely going to be doing this in class next week. And, funny enough, I’ve been holding on to some egg cartons just in case they’d come in handy (I promise I’m not a hoarder). Thanks for sharing! AWESOME, Leslie!!! so glad you’ve been hoarding….I mean SAVING egg cartons! I hope this will be a fun activity in your class!! !